Apple today announced two iPhones - the 4.7" iPhone 6s and the larger, 5.5-inch iPhone 6s Plus. The company's first try at a phablet fame proved remarkably successful, despite its higher price and middling screen-to-body ratio. It was pretty imperative that the team from Cupertino finally had something to answer the ever-growing average screen size of the Android competition, and it delivered with 6 Plus, for those of its fans who were longing for a big-screen iPhone since the gizmo's inception. Has anything changed in overall size or screen-to-body ratio with the new iPhone 6s Plus, when compared to its predecessor, and the larger Android crowd? We are pitting the 6s Plus here against modern Android behemoths, such as the Note5, Xperia Z5 Premium, LG G4, Mate S, and other biggies for your viewing pleasure. As you can see, since the dimensions have stayed largely the same (no wonder, as the 6s Plus arrives in a chassis very similar to the 6 Plus), Apple's second phablet edition still suffers when it comes to screen-to-body ratio. The iPhone 6s Plus is larger than the Note5, which actually has a 5.7" display, and all the 5.5-inchers are smaller than the 6s Plus, too. For now, Apple is tied with its iconic circular home key, so we doubt it can do much about the bezel there, unless it is willing to redesign its signature home key completely. Check the comparison below and share any thoughts you might have on this bezel-heavy matter. "It's almost as big as the Note5,which has a 5.7" display"..."almost"...what? Its That Circular Home Button Bro. Makes The iPhone's Taller Than They Should Be And Gives Them Unimpressive Screen-Body Ratios. I Wish They Would Put It On The Side. They Could Increase The Display Size And Keep They Same Body Or Reduce The Body Size And Keep the Same 4.7in Screen If They Did. that wasn't my point. Of course their design choice would require more physical space I was questioning phone arena's choice of words.....I see they've changed that now. Wrong. Not only the Home Button. See the side bezel too. And that is most important to hold the big phones. Is more like using old display tech for better profit. The Top And Bottom Bezels Are The Biggest Issue Tho Not The Side, If The Home Button Was Gone They Could Shorten The Devices. I was ROTF at same ! The antic iPhone 6S Plus is clearly bigger than Note 5. And that on the article is not just mistake. for a top-end handset, it has rather poor screen-to-size ratio. At the point we get up to 5.5" to 6" screens, the handset needs to be as svelte as possible. This carries over the portly bezels and make it more unwieldy than it ought to be. All 2015 Samsung phones look better than iPhone, what a time to be alive!! Samsung wins one by one on all the things that Apple brags for. Apple tried to copy S-Pen , but just made a joke. lol The 6 plus is a joke in terms of dimensions. 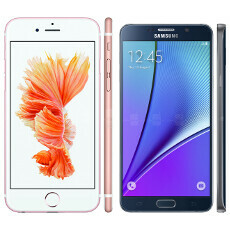 http://www.phonearena.com/phones/compare/BLU-Pure-XL,Apple-iPhone-6s-Plus,Motorola-Moto-X-Style/phones/9639,9502,9553 This is the comparison I truly care about. 64 GB Pure XL at $350, Moto X Pure 64 GB at $500, fully decimating the $850 iPhone 6S Plus 64 GB in specs and price. Didn't everyone know the 6S+ was going to be the exact same thing physically as the 6+, like all the other "S" years? Are we having a discussion here on the exact same bezels as last years? Seems like a lot of posts over the obvious.